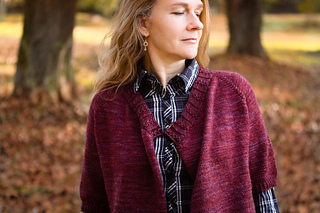 A shapely topdown raglan with extended fronts, Pauroxo has a swingy A-line shape when worn open, and an enfolding cropped jacket vibe when closed with a shawl pin or belt. 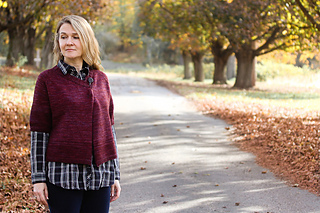 This easy cardigan is knit seamlessly with simple rolled front edges and Twisted Rib details at the neckline and hems. 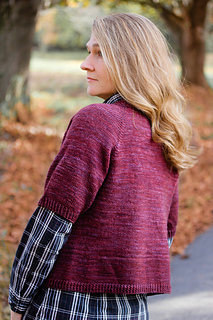 Pau Roxo is Portuguese for purple wood, and this cardigan is inspired by the striking deep violet wood from the Purpleheart tree found in tropical rainforests. 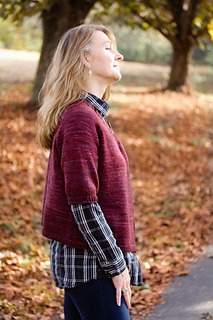 and length may be customised easily; just try on this topdown cardigan as you knit. 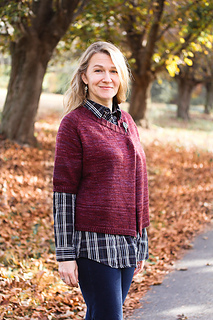 Techniques & Skills Used: longtail CO, raglan construction, knit/purl, increasing/decreasing, picking up stitches. 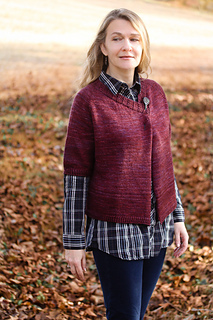 Size: 32 (34, 36, 38, 40, 42, 44, 48, 52)” bust; this easy shaped cardigan is designed to be worn with some positive ease. Sample shown in third size with 1” ease. Yarn: Madelinetosh Pashmina (75% merino, 15% silk, 10% cashmere; 360 yards/329m/117g); 3 (3, 3, 4, 4, 4, 4, 5, 5) skeins, shown in Bergamot. Other Materials: US 4 (3.5mm) 40” circular needle; Stitch markers (10); Removable stitch markers (2); Stitch holders (2); Yarn needle. Gauge: 24 st and 34 rows/4” in stockinette stitch; 24 st and 28 rows/4” in Twisted Rib, after blocking. 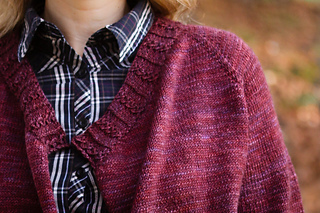 Thank you to my lovely test knitters, and to my wonderful tech editor Kate Vanover. For questions or to show off your sweater, please visit my Ravelry group, The Knitting Vortex.